Pretty much every big-name flagship phone that isn’t an iPhone ships with wireless charging support at this point, and Apple’s iPhone lineup is rumored to be getting wireless charging support as well later this year. You know how many of those phones actually ship with a wireless charging pad in the box? You guessed it… nada. If you actually want to take advantage of one of the most convenient features on your smartphone, you’ll need to purchase your own wireless charger. Our recommendation is the KMASHI Wireless Charger. It supports newer fast wireless charging tech so it’ll fill your phone almost as fast as a corded quick charger would, and it only costs $10.99 on Amazon right now. 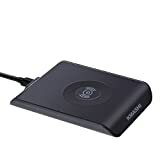 Easy to Use: Use the original QC 3.0/2.0 adapter and cable from package or your own as its power source, then put down your device in the center of the wireless charging pad, it could charge. Fast Charge Mode (15W Output Max): Just put your phone on the charger, this Qi wireless charging will fast charge your Galaxy S7 / S7 edge / S6 / S6 edge / Note 5. Standard Charge Mode for all QI enabled devices: Samsung S6, Samsung S6 edge, Nokia Lumia series, Goole Nexus series, LG G series, Verizon HTC Droid DNA, Verizon HTC 8X, SONY Z3Y. Guaranteed Safety: Built-in intelligent detector will protect your devices from over charge, short circuit, overheating. Package include: 1*Pando K9 Fast Wireless Charger, 1*USB Charge Cable, 1*User Guide, 1year warranty and friendly customer service.